Review of Schlafly Winter ESB | Beer Apprentice - Craft Beer News, Reviews, Interviews and Info. 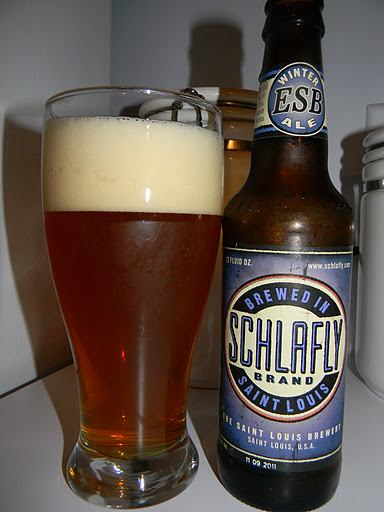 For today’s craft beer review I’m going to be enjoying a Schlafly Winter ESB produced by the St. Louis Brewery located in St. Louis, Missouri. As I have mentioned in previous posts, I really think that the Schlafly brews are very solid and worthwhile, so I would expect this one to follow suit. From the website, schlafly.com, we find this description of the Winter ESB. Our Winter ESB (Extra Special Bitter) may have the word “bitter” in its name, but the key to this style is balance. While having more alcohol and English hop character than its Pale Ale cousin, the addition of extra crystal and biscuit malts give the beer a toasty, fruity flavor. Our ESB is dry hopped with a US grown hop varietal called Williamette, which has a pronounced spicy, lemon flavor. In the early 1970’s, brewers in London and the south of England expanded the range of beers available in pubs, reacting to the wave of European lagers moving into the British pub scene. In addition to the ordinary bitters and pale ales, brewers developed recipes for stronger premium ales like ESB, special bitter and special pale ale. These beers contributed to the English traditional ale revival of the 1980’s, making their way into the beer portfolios of many American craft breweries. This brew comes in a 12 oz. bottle and has an ABV of 5.8%. The beer poured a slightly hazy orange to light amber color with some burnt orange highlights around the edges of the glass. The head was off white in color, of good size, rocky, soft and fluffy. The retention time was adequate and the lacing looked pretty good I thought. The smell was soft and gentle with hints grapefruit and orange citrus mixed with a light, subtle sweetness of caramel malt. Hints of rye bread and toasted biscuits coalesced with some faint grassy hops. Nothing too robust, but rather well balanced and pleasant. Honestly, this brew reminded me a little more of a Pale Ale as opposed to an ESB. The taste brought out more of the rye as well as the toasted biscuits. Some fruity grapefruit and orange zest counterbalanced the malt very well. Subdued grassy and piny hops provided a slight caress on the tongue along with a decent amount of bitterness. The caramel sweetness became a tad more noticeable as the beer warmed, but the hops were the prime factor with the flavor. Again, nicely balanced, harmonized and pretty tasty. The mouthfeel was medium bodied, dry, crisp, smooth and slightly creamy. A very good amount of lively carbonation helped to retain a bit of flavor on the palate after each sip.